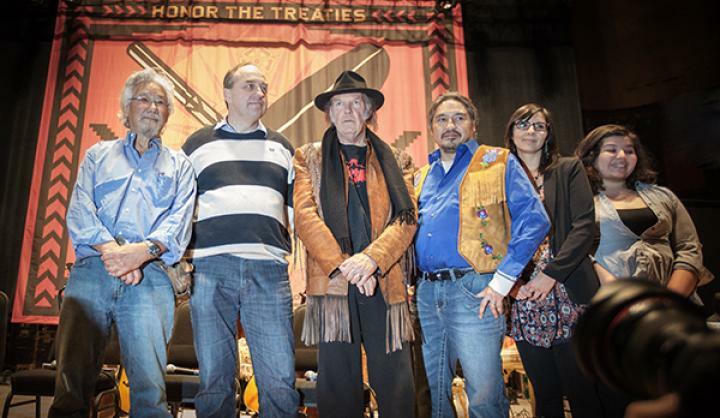 Neil Young (centre) at last January’s Honour the Treaties press conference, Massey Hall, Toronto — photo credit: Dustin Rabin. Neil Young announced he’s doing a concert in Edmonton on July 3 to benefit the Athabasca Chipewyan First Nation Legal Defense Fund, an organization that’s fighting the Grand Rapids pipeline implementation. The show, which is under Young’s “Honour The Treaties” banner, is a continuation of a benefit tour he conducted last year. I wrote about it for Samaritan Mag. To read the full story go here.